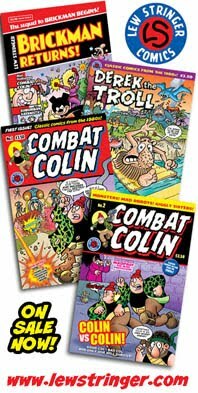 It seems the only way some British comics classics are ever going to see the light of day again is if fans obtain permission to publish their own limited edition reprints. 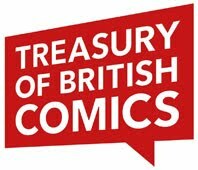 Such is the case with Hibernia Comics, who gained permission from the Dan Dare Corporation to publish a collection of The Tower King, a 32 year old strip from the pages of Eagle. 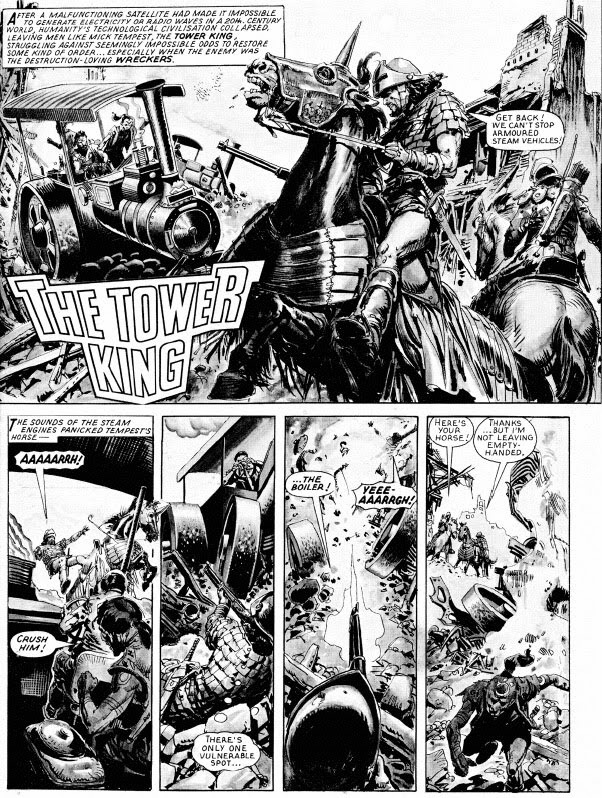 The Tower King was written by Alan Hebden and illustrated by José Ortiz, and for many of us was the highlight of the revived Eagle in 1982. This 80 page collection brings together all 24 chapters with superb reproduction on crisp white paper. The concept is brilliant boys adventure material; in the 1980s an accident with a solar power satellite triggers off the deletion of all electric power on Earth, bringing chaos and anarchy. Small groups of survivors battle for their lives in a sort of Medieval state with the remnants of what remain. 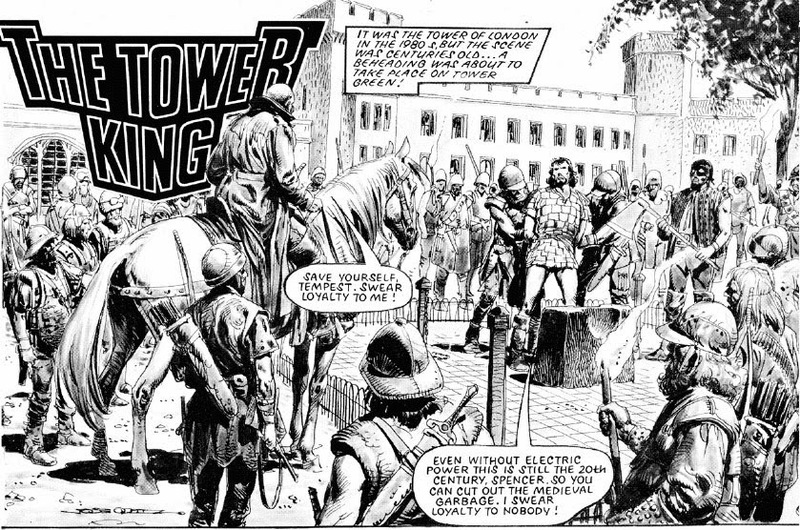 One group is led by our hero, Mick Tempest, nicknamed 'The Tower King' because his people are located in the tower of London. With the 'decompressed' methods of modern adventure comics it comes as a refreshing change to read such a tightly packed, fast-paced story. Admittedly, there's not much room for any characterization, but the action and inventiveness more than makes up for that. The structure of these old three-page episodes was to resolve the previous week's cliffhanger, pile on the action, intrigue, and excitement, and leave a new cliffhanger for the following week. Alan Hebden ably proves how absolutely brilliant he is at it. 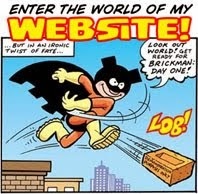 (Some modern-day stories in 2000AD seem so slow and gentle in comparison.) It's a storytelling technique that deserves far more respect from some quarters of fandom than it receives, but thankfully there are a lot of fans who do appreciate this classic method of episodic storytelling. As for the artwork, José Ortiz was the perfect choice for this kind of tense, exciting action strip, making busy, detailed scenes look effortless. He depicts the world of The Tower King as a grimy, damaged and dangerous place, making even the sillier aspects of the plot appear convincing. As was typical of many adventure serials of the time, the ending of The Tower King seems all too convenient and somewhat rushed. I'd guess this was due to Alan Hebden perhaps being told to wrap everything up at short notice. 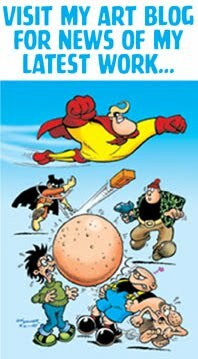 However, this in no way detracts from the overall story, and at least we get a proper ending, unlike some UK adventure strips which tended to leave things unresolved. Wasn't Alan Hebden the pen name of Barrie Tomlinson? Not as far as I know. Where did you read that? 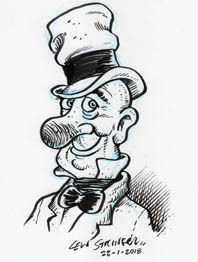 Alan Hebden was the comic writing son of Eric Hebden, who himself scribed not a few strips. I believe Barrie Tomlinson's own son used a nom de plume (but nothing like ‘Hebden’). OK, I give in. I've bought this and a few other bits that I have been meaning to buy for a while. Looking forward to getting this and having a look. Thanks thebristle. 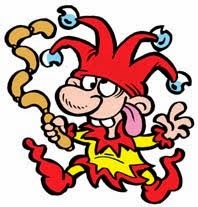 Also, Alan Hebden is still working today. He has an issue of Commando on the shelves right now. Mine just arrived yesterday. Looks very nice, I was just disappointed that it is basically a giant stapled periodical with a paper cover. I wish that it was a squarebound trade paperback. Barrie Tomlinson's pen name was D. Horton, for most of the Death Wish stories, and Barries son's name was James Nicholas, who wrote quiet a bit of material in the later years for the eagle. Nicholas was his middle name, he is James Tomlinson. Thank's for the review Lew, delighted you liked it. My pleasure David. It really is a great read and the repro is excellent. Kris, I'm reliably informed that making it square bound would have made it difficult to read the art that was close to the spine, and would have pushed the price up too much for such a small print run. Ahh, I see. Folks should act fast. I ordered two copies (one for me and one for my friend) and we received 173 and 174 out of 200. I ordered mine as soon as I got the eamil from Hibernia (as I have ordered before etc)& it didn't disappoint. Great story & art throughout and I thought the format was more than adequate. I hope your review Lew will entice more people to order the book before they run out or failing that, demand another print run! 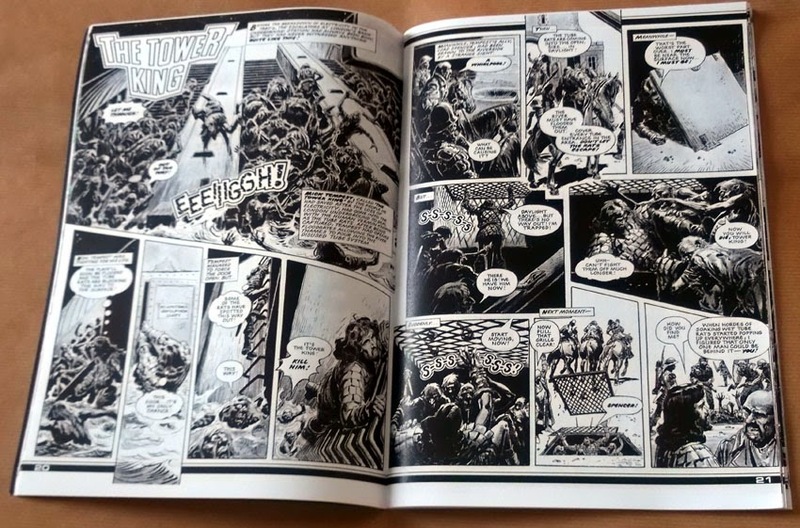 José Ortiz did some really wonderful works for 2000AD. 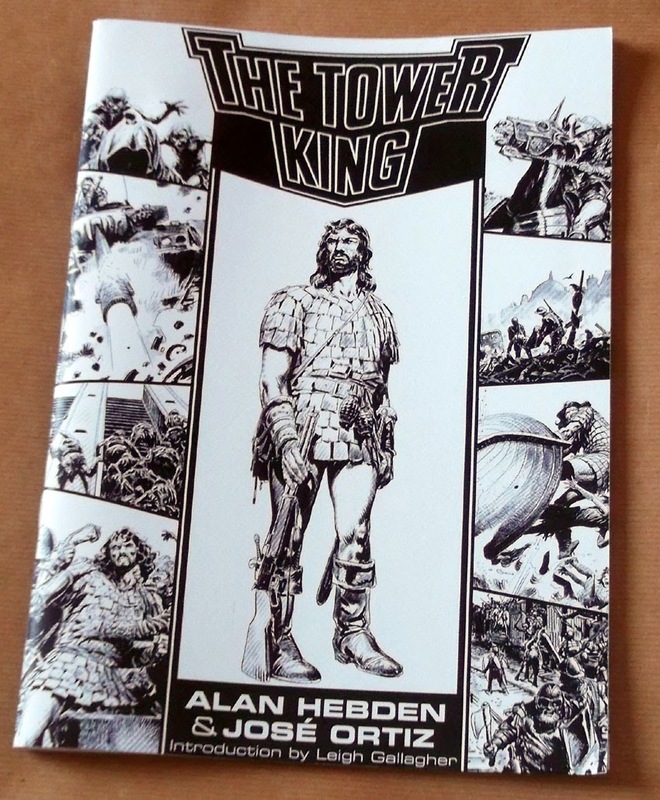 For some reason I haven't read The Tower King but it's good to know there is a collected edition. On the subject of pen names, Alan Hebden is supposed to have worked under the name Ben Haldean (or maybe Haldane). Reading The Tower King took me right back to the first time it was out and underlined why Commando still use him — boy, can he write a story. It's just a pity there aren't more platforms for talents like his. A little late I know but the strip reminds me a little of the American TV series Revolution where an event causes Earth to lose the ability to generate electricity. 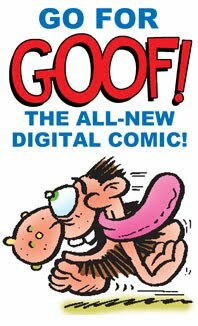 Since the comic strip came first, I wonder if the producers got their inspiration from it? I doubt it but who knows? 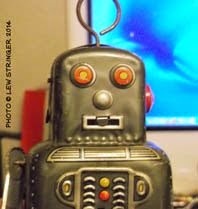 I haven't seen that TV series, although the concept has been used in SF a few times over the years.